Our children are now in primary school and are able to read independently. However, DaDi and I still have the bedtime routine of reading aloud with our children together. You may wonder, since they are able to read on their own, why do we still read aloud with them? They are growing up too fast, and we really want to savour every single moment that we can cuddle and read together! Enjoy this special moment while stock lasts! Reading aloud together is a way to provide our children a sense of security in our love for them. It is especially important for our family as both DaDi and I are working parents. While we may not have the quantity of time with them on weekdays, we would love to spend quality time with them. During our reading time, we give our children our undivided attention, showing them that they are important to us. "How would you feel if you were this character?" "What would you do if you were this character?" "Did you encounter this situation in school? How did you react to this?" So even though our children can read silently on their own, we still find time to read with them, so that our parent-child relationship grows even stronger! Geronimo Stilton and his family were invited to Lisbon, Portugal, to retrace the journey of the great explorer Vasco da Gama. He was the first European to reach India by sea, and was apparently an ancestor of the Stiltons! He learned that someone was trying to sabotage the voyage. Who was that? 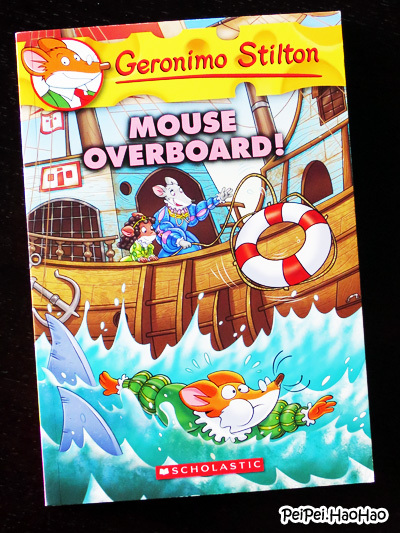 Our children are great fans of Geronimo Stilton! The colourful illustrations and text engage the children. Other than the location and weather of Portugal, we also learned about the places of interest in Lisbon, the capital city of Portugal. Sisters Tori and Miranda are practicing to compete in a horse show. The girls also make costumes to wear for the show! Ashley, a mean girl who boards her pony at Gran's ranch, is competing, too. And she has a brand-new outfit. Ashley brags that she will win a blue ribbon - not them. Do Tori and Miranda have what it takes to win? At the end of the book, there are some questions provided for the parents to engage discussions about feelings with the children. The character Ashley, a mean girl, provides a platform for us to discuss how we can deal with difficult people around us. Eerie Elementary #3: Recess Is a Jungle! Sam, Antonio, and Lucy are passing around a soccer ball at recess, and soon they find themselves in a fog-filled jungle! The friends discover that everything on the school grounds come to life! They must find their way out of a monstrous hedge maze in time to rescue the rest of the students! The story is dynamic - it is packed with actions! It is not that kind of horror story that scares the children. It is a spooky yet fun story to read and share the excitement with the children! There is a sunken ship full of lost treasure underwater. The divers use their submarines to find it. But there was a "ghost"! As big LEGO® fans, we built submarines using the bricks and acted out the story while we were reading it! Chloe felt sad when she lost her favourite toy. Omar felt sad when the pet he loved died. What did they do when they felt sad? We talked with our children about sad feeling, and how we can cope with sadness. While we were reading the story, we sent an important message to them - we are always there for them! Haggis and Tank set sail as pirates. At first, Haggis doesn’t see what Tank does - that an adventure awaits them with just a little imagination! But soon, Haggis joins in the fun and the two friends go on a pirate adventure. They talk like pirates, swab the deck, and even search for buried treasure. This series is full of clever wordplay and homophones make us laugh together! Laughter makes our hearts closer! Scholastic Asia kindly offers to sponsor Haggis and Tank Unleashed #1 - All Paws on Deck to 5 lucky PeiPei.HaoHao readers! Each reader will receive one copy of the book. This giveaway will be closed on 1 April 2016, 2359 hrs. Congratulations to Theresa Tay, Karen Low, Chew Ling, Meiree and Julie Tan! Check out Scholastic Asia for more interesting books!